It's always a good day when pictures like this show up in your inbox. The following three pictures are from the 1939 & 1940 seasons. Thanks to the dedicated reader who took time to send them in. 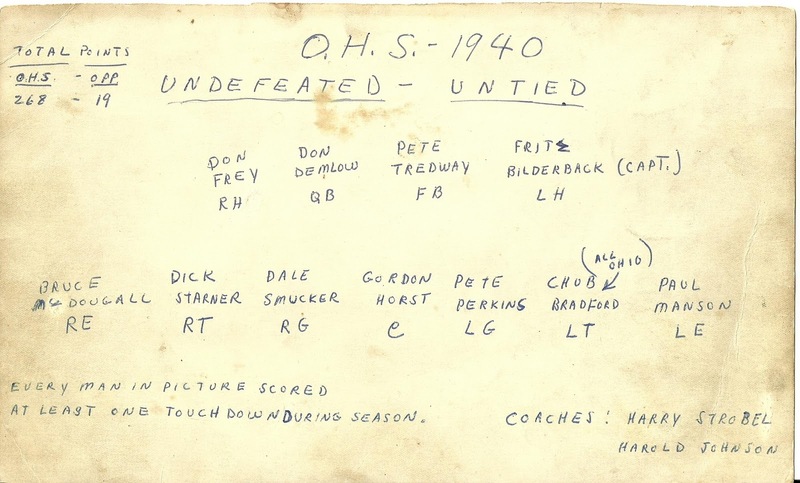 The 1940 team was the first Orrville team to finish the season with no losses or ties. There were two teams prior that went unbeaten (1924 & 1939), but not untied. They beat Wooster in the final week, 13-7 to put the wraps on an 8-0 season. This is what "Red Rider Tradition" looks like. Enjoy. The uniforms are a thing of beauty too. The jersey's look darker than the pants. Perhaps the jerseys were black with red numbers and the pants were red? Love that shoulder yolk too with red & white stripes and the leather helmets. The following picture corresponds with the one above. Pay attention to the note that lists Lowell "Chub" Bradford as an All-Ohioan. 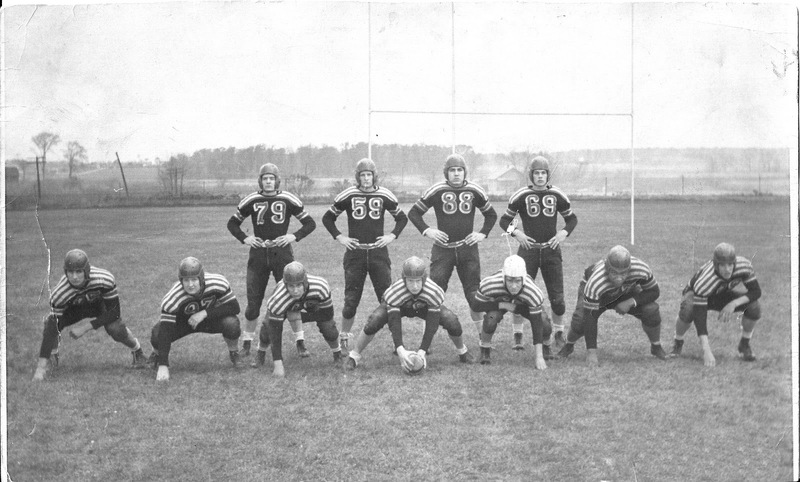 He's the second player from the right on the offensive line in the picture above. Compare his size to the other linemen. Is it any wonder he was an all-state player? That's the kind of guy you want lead blocking. The quintessential left tackle. The most awesome note is "every many scored". Wow. I love seeing this picture for many reasons, one of which is seeing Dad - Harrold Johnson, coach on the left. The Head Coach, Harry Stroebel, went on to coach at Ohio State. Dad used to say that Harry wanted him to come along. I think at times he regretted that he didn't do it! I still have the engraved gold football charm from the 39 season and I wear it as a necklace. Thanks for sharing this, Tim. Keep up the good work. GO RIDERS! This is awesome! I knew the Bilderbacks when I lived in Orrville as a kid. I wonder if Fritz was the father of the kids I knew? My Grandpa is #99 Walt Mckee. He went into the OHS HOF in the 90's with my classmates Tom Bolyard and the late great Jack Leeder. Fritz Bilderback was indeed the father of a large family here in town with wife Liz. Ray, Ron, Sue, Beth, are just a few of the kid's name that come to mind immediately. It was a big family......8-9 kids at least. This photo is loaded with OHS Hall of Famers. Don Demlow, Fritz Bilderback, and Coach Strobel, for starters. Then of course, Chub Bradford, who was Orrville's first All-Ohio player. 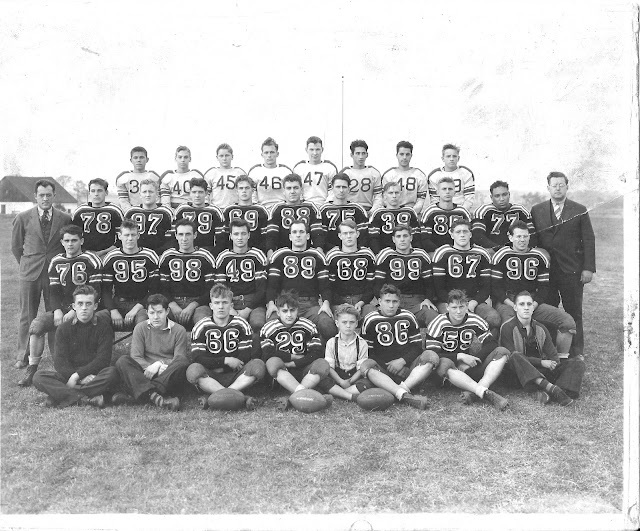 And #29 in the front row of the team picture is sophomore Joe Yonto, a charter member of the OHSHOF. OHSAA Harbin Computer Points.....A Tutorial. Here's Kyle Simmons in a commercial....again. What's up with the Orrville helmets?